1996 SHERIDAN UB227 perfect binding line with Xycom Automation Pro-Face touch screen controller, Sheridan gatherer, (27) pockets, model RG-318, (27) Omron ZFV-A10 verification cameras, ZFV inspection terminal, ST1 conveyor bundle loaders, Eltex Hurletron high voltage generator, Nordson Pro Blue-7 tip-on gluer, Dynapro touch screen gatherer controller, downstream inhibiter, gatherer reject conveyor, conveyors, milling station, (2) saws and (1) rougher, 2012 Craftex dust collector, Nordson hot-melt unit, model Pro Blue, Valco Cincinnati pre-melter, conveyors, Muller Martini 3-knife trimmer, model 3670, all electrics and controls. HEIDELBERG Pacesetter 705-6 saddlestitcher, s/n SL142. 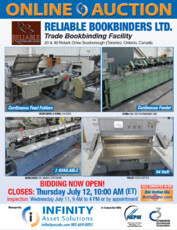 Includes (7) gathering pockets, cover feeder, ink jet station, Prism controller, (no ink jet heads), 705 stitcher w/ Hohner 52/8 heads, trimmer and Rima RS-105 9 ¼ counter stacker s/n 106230-10 (yr. 2000). HEIDELBERG Pacesetter 705A saddlestitcher, Md. 705-12 s/n SL113. Includes 2 cover feeders, 4 gathering pockets, electronic caliper station, ink jet station, 705 stitcher w/ Hohner 52/8 heads, Rima counter stacker, 2x Kodak Scitex Versamark 5240 ink jet heads, Prism controller, Speed Dry 4560x ink jet dryer and spare parts cabinet. MULLER 335 saddlestitcher Md. 335, s/n 99,17474 with (6) Md. 306 gathering pockets, 1528 cover feeder (1996), Md. 890 three knife trimmer and 310-14 counter stacker includes approx. (5) Muller stitch heads, 5 knife attachment and cabinet of spare parts and extra base. HEIDELBERG Stahl B30 continuous feed folder, s/n 701019, model B-30/4 BRD and includes Pre score shaft, 8pg. and 16pg. sections 4/4/4 zero make ready plates, 1430A-RS mobile delivery. HEIDELBERG Stahl B30 continuous feed folder, s/n 701242, model B-30/4 BRD and includes 8pg. and 16pg. sections 4/4/4 zero make ready plates, 1430A-RS mobile delivery. STAHL TFU78/444-RF-2 30” continuous feed folder, s/n 40307 with 8 and 16 page sections, 4/4/4, zero make ready plates and SAK 78 delivery. STAHL TFU78/4-RF 30” continuous feed folder w/ pre score shaft. s/n 37150. 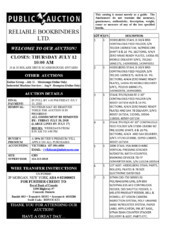 Includes 8 and 16 page sections, 4/4/4 and SAK delivery. HEIDELBERG Stahl spare parts, rollers, plates and 78 size electronic gatefold. Murphy 25HP dust collector, 2012 Hydra-Pak 1500 waste compactor, Dansep-12 waste separator, (2) Atlas Copco 50 h.p. rotary screw air compressors, machine shop, material handling and more.